Tahsin Ifnoor Sayeed, Dnet’s Head of Business Intelligence participated as a panelist in the Bangladesh Innovation Conclave 2017 held at Le Méridien hotel in Dhaka on Saturday May 20. Dnet not just thrives on digital innovation in the space of socioeconomic development but also actively promotes and nurtures the youth in innovation. 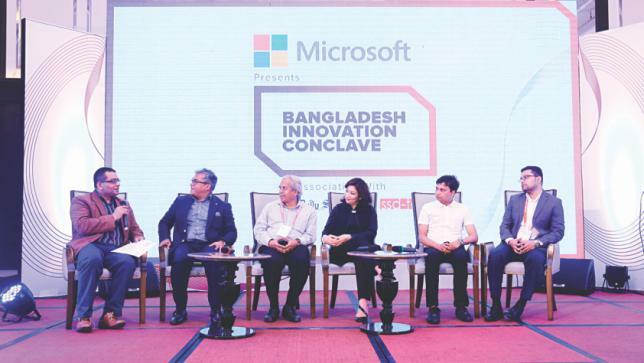 Discussants and analysts seemed to think alike at the Bangladesh Innovation Conclave 2017, a daylong summit held in Dhaka on Saturday May 20. They believe innovation and a resilient culture of entrepreneurship will be very pivotal to Bangladesh’s growth story ahead. Tahsin Ifnoor Sayeed, Dnet’s Head of Business Intelligence participated as a panelist at the summit. In a panel discussion titled 'Successful Innovations', Tahsin discussed how Dnet kept the flame of innovation alight over the past 16 years. He stressed on the importance of building for scale and sustainability, designing with the users and building collaboratively as major drivers of a successful innovation.